This pack of magazines is enough to last you your entire match! The eight magazines hold up to 90 rounds each which is perfect for those who want the added realism from reloading. The Echo 1 Dogs of War magazine is recommended for use with the Echo 1 SG series. It may work with other brands AEG airsoft guns, but this cannot be guaranteed by Airsoft GI. Please thoroughly inspect any parts for defects before attempting use. Bought for a TM MP5K PDW. I've exclusively used Echo 1 Dogs of War M4 magazines and I absolutely love them, never had a single issue with feed, quality, or fit - I own 10 of them. Great mags, really well built, higher capacity than standard TM mags. Only issues I've come across so far are that the baseplate on a few of mine rattle a little, and while length of the mag itself doesn't matter, the width and height do. Across the top (side to side), these mags are identical to the TM mag. 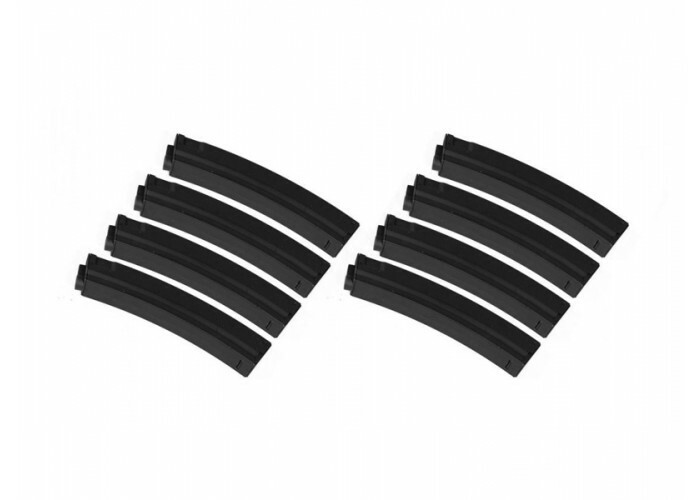 Front to back, the E1 mags are 1/16" longer than the TM mag - you may see issues with some mag wells. I'll just file the back of mine down and make the two happy together! I haven't fielded them yet, but I intend to get them working and put them through their paces as soon as possible. Minor rattles on a few - the baseplate is a separate piece and some are not fit as closely as others. Larger front-to-back than OEM Tokyo Marui mags - check your fit!